The Lassco Wizer CR-50 Manual Corner Rounding Machine features a hands-free operation and hold down clamping that secures the stock with each stroke. The CR-50 is manually powered with a conveniently located foot pedal for fast and economical cornering. 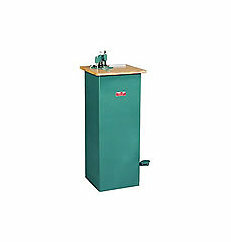 This machine accepts a huge range of cutting units from 1/16” up to 1-1/2” with a maximum cutting depth of a 1/2 inch. This unit comes with one standard cutting die, choosing from 1/8″, 1/4″, 3/8″, or 1/2″. The CR-50 can easily be adaptable for using larger radii up to 1-1/2″ and is designed to cut either paper or plastic. The CR-50 is a floor standing corner rounder that is ideal for print shops, production environments, and larger businesses. If you have any questions or are interested in the CR-50 Manual Corner Rounding Machine, visit me at SpiralBinding.com. We have great pricing on a full line of Round Cornering Machines. Call us at 1-800-631-3572 for more information!